The Saxothuringian Zone sensu strictu comprises a large part of the NW edge of the Bohemian Massif and a very small one of the northernmost Black Forest in the environs of Baden-Baden as well as of the Vosges (Fig. 1). 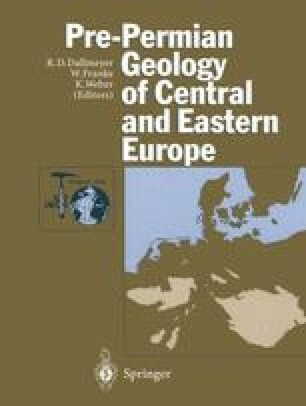 Not surprisingly, the Saxothuringian Zone of the Black Forest and the Vosges is of less importance regarding metallogenesis than the area belonging to the Bohemian Massif, that bears a great many sites of mineralization, formerly operated for base metals, as well as some first-class Sn, W, Ag, and U deposits, that have only recently been shut down for economic reasons. These sites of mineralization have been the target of many studies, with a wealth of publications during the last decades, out of which only some comprehensive papers are mentioned: Chrt et al. (1966); Reh and Schröder (1974); Bernard (1980); Štemprok (1980); Dill (1985a); Legier (1985); Baumann et al. (1986); Pouba and Ilavsky (1986); Tischendorf (1986); Walther et al. (1986); Tischendorf comp. 1989; Tischendorf and Förster (1994).